Finding something to keep little ones busy, day in and day out, can be a challenge for parents. Jessica McFadden shares her best tips for summertime fun in the D.C. area. WASHINGTON — The days are long, the air is hot, and let’s be honest: there’s a lot of time to kill in the months the kids are out of school for summer vacation. Finding something to keep little ones busy, day in and day out, can be a challenge for parents. The local public library is McFadden’s first stop when it comes to summer activities. She says during the warm-weather months, the libraries amp up their public programming with summer reading contests and performances for kids. Plus, there’s air conditioning! Sure, you may have your staple park or playground, but summer is the perfect time to search out a new park — maybe even one in another county. “Going to a new park is a whole new world [for kids], even better than an amusement park,” McFadden said. Prince George’s County is known for its themed playgrounds, including the popular “Wizard of Oz” park; McFadden’s favorite is a castle-themed playground at the South Germantown Recreational Park. Taking young children to the pool for the day can be stressful — especially if they’re not strong swimmers. That is why McFadden recommends toting tots to one of the region’s many splash parks as a safer alternative to cool down on a hot day. “You don’t have to worry about them as much because they’re standing up and the water is being drained away,” McFadden said. 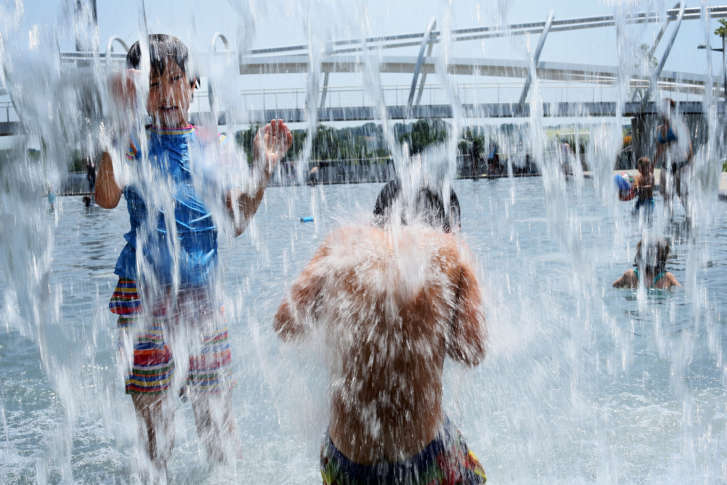 Fountains in downtown centers, such as Silver Spring and Yards Park, are open for kids to play in during the summer. Check your local county’s website for the closest splash park. Many are planted in the neighborhood playground. Lots of area shopping centers host summer concerts, such as the Rio in Gaithersburg, Maryland, or the Reston Town Center in Virginia. Performances often take place in the evening, making it a great opportunity to get outside when the temperatures are a bit cooler. McFadden says another great spot for live entertainment is Strathmore, which hosts “Strathmore Live From the Lawn,” a free summer concert series in the summer. Bring a cooler, pack a picnic and relax with friends and family. The Regal Cinemas theaters in the D.C. area offer $1 movie deals during the summer. A word of warning: Get there early. There are also plenty of outdoor movies in the area, which McFadden is a huge fan of. “Often children do fall asleep at the movies, so why don’t they just fall asleep on a blanket where it was free and you can all enjoy the movie together,” she added. In D.C., the Adams Morgan and the Capitol Riverfront neighborhoods host outdoor movie screenings. National Harbor also shows movies on an outdoor big screen, as does the Cinema Del Ray in Alexandria. “The great thing about the D.C. area is you never know, in the summertime, what you’re going to get. Are you going to have torrential rain? Is it going to be so hot outside?” McFadden said. When the weather is in flux, head to a nearby nature center. If the sun is shining, take a hike and explore the great outdoors. If you’re not so lucky, head inside for hands-on learning activities. “You can plan a play date, you can plan to meet friends there, and you can have both outdoor and indoor things to experience,” McFadden added. Her top recommendation is the Rock Creek Park Planitarium because visitors can combine an outdoor adventure with interactive toys indoors. Cap it all off with a kid-friendly planetarium show. Expert tip: Just pick one! Feeling overwhelmed when it comes to planning a fun day? Relax, McFadden says. All you need is one activity. McFadden says getting out and doing something just once a day will result in better behaved kids — and better sleepers. “Leaving the house is key to children who will go to sleep for you at night,” she said. Find more of McFadden’s summer activity tips when you play or download the full podcast episode. activities for kids in the summer DC D.C. summer events DC family-friendly activities Every Day is Kids' Day Every Day Is Kids' Day Jessica McFadden Latest News Parenting podcast podcast Sponsored Content summer activities D.C.